When Tomas came to the ASC Health Clinic for assessment and triage, it unfolded that he had not received medical care for his Type 2 Diabetes for two years. 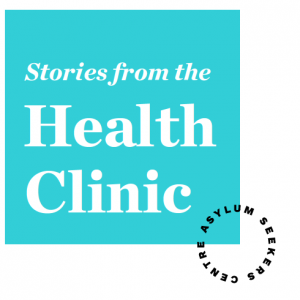 Originally from Eastern Europe, Tomas had inadequate treatment and monitoring during a transitory period of fleeing his country of origin and then for at least six months after arriving in Australia. Now that Tomas’ diabetes is being managed and he’s receiving care at the Clinic, his health is stabilizing. *Name has been changed. 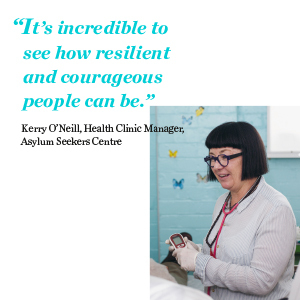 Please give generously to support people seeking asylum in our community. 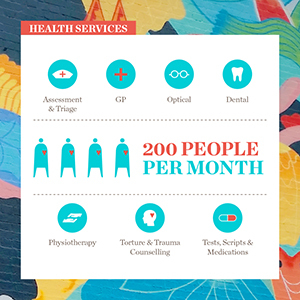 Operating out of one small room in the Centre, with just one treatment bed, desk, chair, computer and sink, the ASC Health Clinic sees an average of 200 people each month. 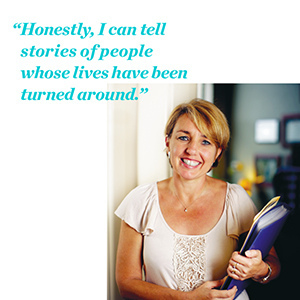 An important part of the service is health literacy, and as people gain access to Medicare, we support them to navigate the health system. 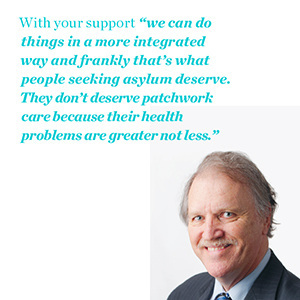 We actively work with primary health networks to find GP’s who not only speak other languages but are also attuned to the unique needs and experiences of people seeking asylum.